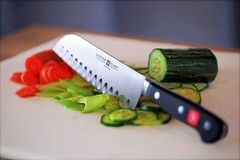 Slice, dice, mince & chop with a Japanese Santoku knife. 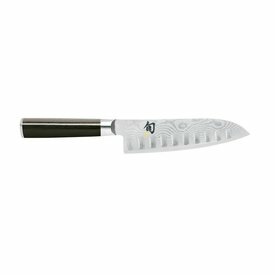 Created by Japanese chefs, the Santoku is designed to cut leafier greens and lighter vegetables that hold more water - like cucumbers. Lighter than a traditional Chef's knife, the dimples in the blade create air pockets to help release cut food from the blade.